The Federal Commission on School Safety (FCSS) held a listening session on August 28, 2018 in Montgomery, Alabama. This forum provided an opportunity for members of the public to speak to the Commission about their views on how schools, districts, institutions of higher education, and other local and state government agencies can improve school safety. 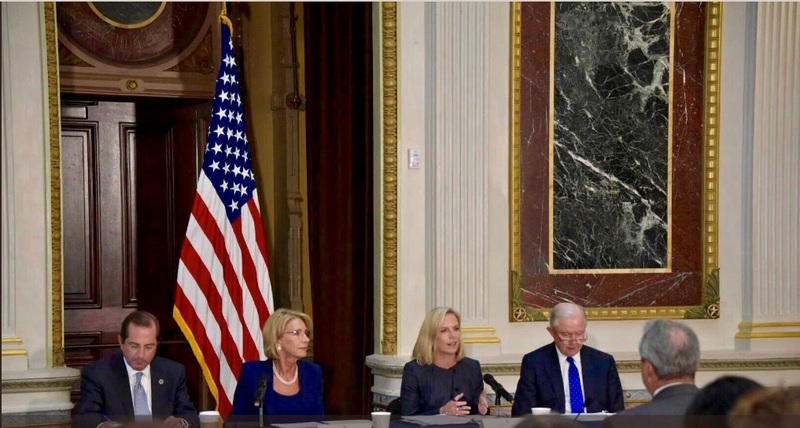 WASHINGTON  U.S. Secretary of Education Betsy DeVos announced today more than $63 million in new federal assistance for 47 institutions of higher education under the Emergency Assistance to Institutions of Higher Education program. The program provides funding to institutions and their students in areas directly affected by Hurricanes Harvey, Irma, or Maria or the 2017 California wildfires. The Federal Commission on School Safety (FCSS) held its fourth field visit on August 23, 2018 at the Miley Achievement Center in Las Vegas, Nevada. The Department of Homeland Security facilitated the visit to gain more insights into what schools can do to enhance their security through various preventive and protective activities. Washington  U.S. Secretary of Education Betsy DeVos announced today a total of approximately $359.8 million in new federal assistance for 20 states and the U.S. Virgin Islands under the Temporary Emergency Impact Aid for Displaced Students program (Emergency Impact Aid). WASHINGTON—The U.S. Department of Education today announced a Notice of Proposed Rulemaking (NPRM) that proposes to rescind Gainful Employment (GE) regulations in order to provide useful, transparent higher education data to students and treat all institutions of higher education fairly. The Federal Commission on School Safety (FCSS) held a listening session on August 7, 2018 in Cheyenne, Wyoming. This forum provided an opportunity for members of the public to speak to the Commission about their views on how schools, districts, institutions of higher education, and other local and state government agencies can improve school safety. WashingtonU.S. Secretary of Education Betsy DeVos announced today that Marshall County School District (MCSD) in Kentucky has been awarded a Project School Emergency Response to Violence (SERV) grant totaling $138,213. This grant will support the ongoing recovery efforts following the Jan. 23, 2018 shooting at Marshall County High School (MCHS) that took the lives of two students and injured 15 others. The Federal Commission on School Safety (FCSS) held its third field visit on August 1, 2018 at the Lake Hamilton School District in Pearcy, Arkansas. The Department of Justice facilitated the visit to learn about the geographic and logistical challenges faced by rural school districts as well as the strategies they have adopted in an effort to meet them.